I worked with a couple of office GoPro Hero 4 cameras while I was shooting video at KSC last year and liked them enough to get an action camera for my own [not-]action-packed life. Given my affinity for tiny devices I went with a GoPro HERO Session, which became a good buy after two price drops and a cash rebate deal. The Session has been a decent compact video camera with acceptable image quality and battery life, and an easy interface for basic use, though the small form factor requires that more advanced functions like managing files and selecting timelapse/burst modes require connecting to the camera with the phone app. Size is more the advantage here over video clarity, but so far the 1080p resolution has been more than sufficient for my needs, and as an added bonus the camera is water-resistant out of the box without needing a case. I tried walking around Washington, DC on a cool, sunny Sunday in May with the GoPro Session to catch some scenery (and oysters) and I like the results. One thing I noticed: I tend to point the lens upwards a bit too much when trying to catch wider scenes like the Washington Monument — a side effect of the lack of a viewfinder screen, though it’s that same lack of a screen which helps the camera’s battery life. I’ve bought a few mounts, harnesses, and a scuba case, and am looking forward to using this GoPro on some dives, hikes, and rides in the future. 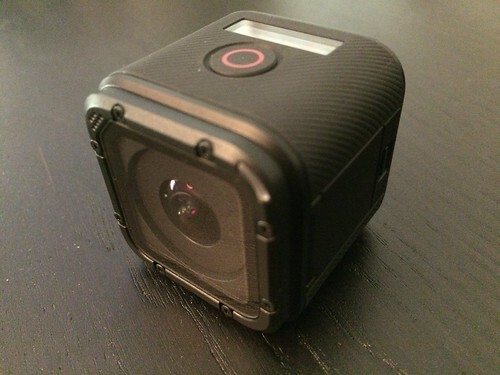 Buy a GoPro HERO Session if you want one.